A summer wedding shower presents the imaginative host with a vast array of opportunities to create a fun and breezy afternoon event with a splash of color and excitement. 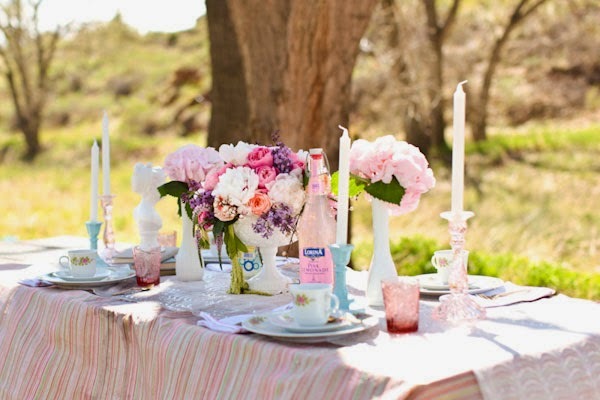 If possible, host the shower outdoors and keep your palette simple with fresh foods, natural arrangements, and eco-friendly favors and decor. Think colorful, fresh, simple, and tasty and you can't go wrong. Centerpieces ~ Mix and match a variety of bold, colorful flowers with fruits, either whole or cut, to create appealing, fragrant centerpieces. 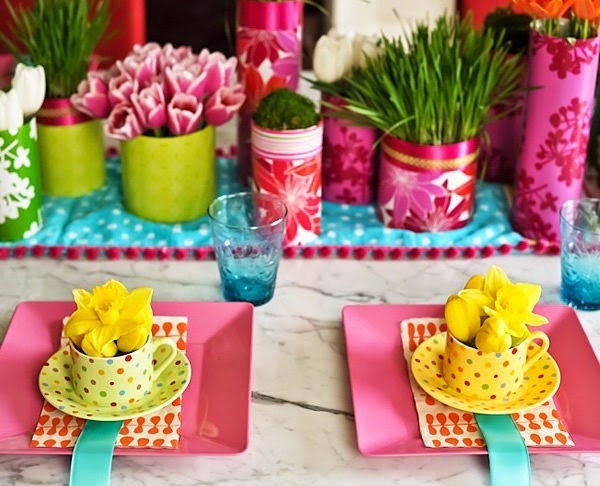 Drop berries or lemon slices in vase water, use whole lemons or perfect tangelos or minneolas in place of water, or really go the distance and create "floral" arrangements entirely out of fruits and vegetables. Feeling really adventuresome... skip the fruits and flowers altogether and bring "good chi" to your guests with gorgeous Lucky Bamboo or Money Tree centerpieces. 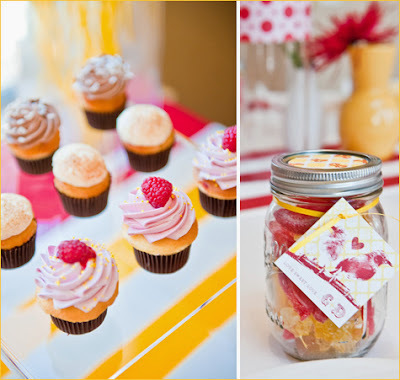 Favors ~ When it comes to favors, think natural, think "eco-friendly." Skip the plastic shoes, pastel mesh, and dinner mints and give your guests a gift they can truly treasure for the entire season, or even years to come. Consider wildflower seed packets, handmade paper plantables, seed cards, flower bulbs, or tree saplings. Tree saplings can be purchased rather inexpensively from the Arbor Day Foundation. Other natural options include hand-carved soaps, tea leaf infusers, soy candles, and essential oils, or continue your guests' good chi with petite Lucky Bamboo favors. Food ~ Fresh, tasty, and light are perfect for your afternoon brunch or tea. 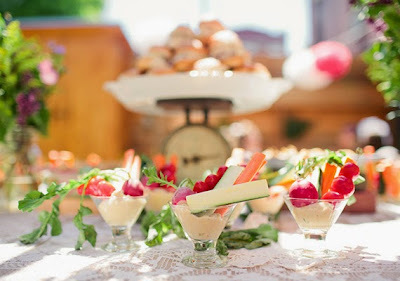 Offer a variety of light foods, including fresh fruits and breads; a cold fruit, avocado, or cucumber soup; chicken salad or veggie/cream cheese wraps; a crisp salad sprinkled with edible flower petals, fresh berries, and a light vinaigrette dressing; and an array of scones, mini tarts, and fresh fruit sorbets. Keep it fresh, flavorful, and light for the perfect wedding shower brunch or tea. Drinks ~ Mimosas or fruit Bellinis with fresh fruits and berries are a refreshing and colorful compliment to your fresh and tasty food selections. 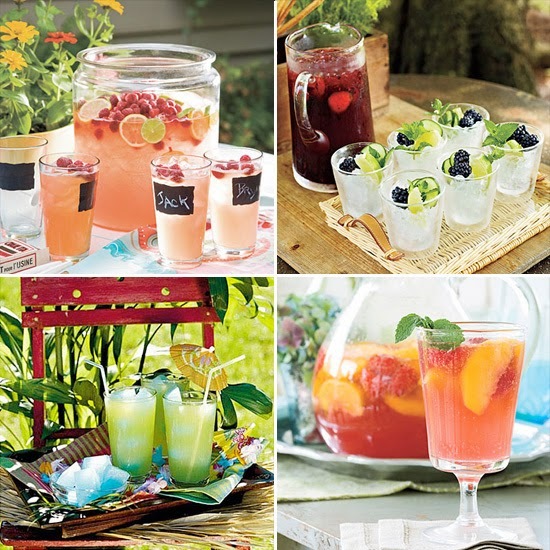 For a non-alcoholic option, offer a refreshing lemonade or raspberry iced tea infused with lemon ice cubes and fresh fruits and berries. Decor ~ Simple white linens and tableware are the perfect backdrop to make your colorful palette really pop. Keep it natural and simple. For evening/dusk showers, add soft, natural lighting to your decor; try floating candles in clear glass bowls to accent your tablescapes and chinese lanterns or candle lanterns to illuminate pathways.